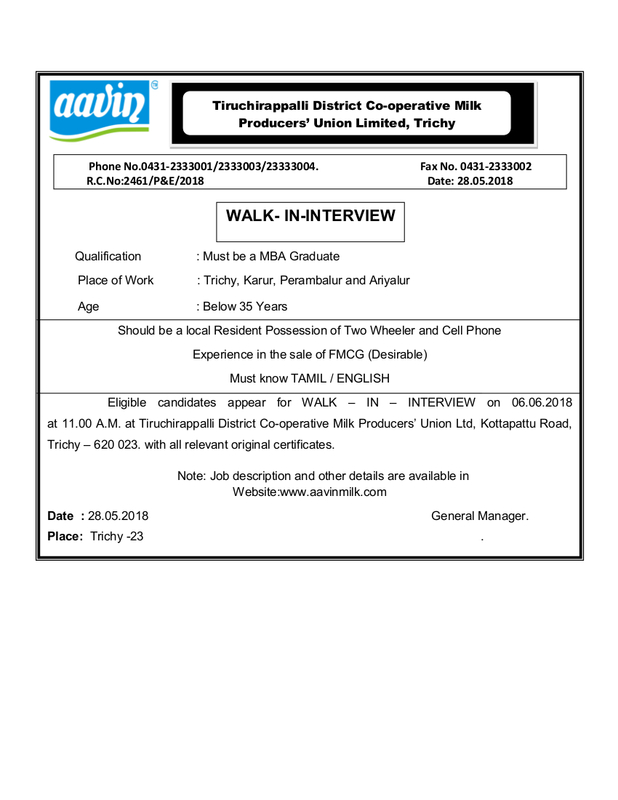 Aavin Trichy Recruitment 2018 2019 Application Form for Marketing Executives Posts Download Application through Official website www.aavinmilk.com. Aavin Trichy Marketing Executives Jobs Notification 2018 Released. 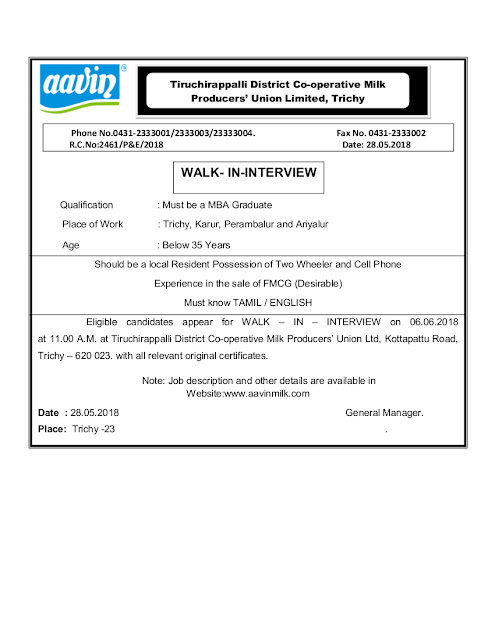 Aavin Trichy invites Walk in Interview for appointment in following Marketing Executives post in Trichy District Cooperative Milk Producers Union LTD. Candidates are requested to Download Application through Official website www.aavinmilk.com. Prospective candidates will have to before Walk in Interview carefully reading the advertisement regarding the process of examinations and interview, eligibility criteria, Offline registration processes, payment of prescribed application fee/intimation charges, Aavin Trichy pattern of examination, Aavin Trichy Syllabus, Aavin Trichy Question Paper, Aavin Trichy Walk in Date, Aavin Trichy Result Date etc. Pay Scale: A Field Executive will be paid a minimum pay of Rs.7500/- on his first month in order to gain adequate knowledge about the retailers, products and other necessary information about the company. From the second month onwards he will be paid a consolidated pay of Rs.12,000/- per month subject to the achievement of minimum target of Rs. 3.00 lakhs per month generated by the appointment of 5 retailers for milk and 5 retailers for bi-products.